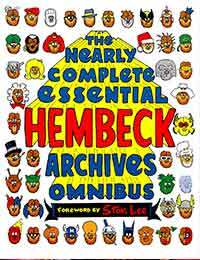 The Nearly Complete Essential Hembeck Archives Omnibus Average 0.00/5 - out of 0 total votes. Finally: a single massive collection, covering cartoonist Fred Hembeck's past three decades of work! All seven of his early ‘80s collections - Bah, Hembeck! ; The Hembeck Files, et al - are included, as well as rarely seen strips, personal commissions, online pieces, holiday cards, assorted oddities, and over a dozen stories ranging up to ten pages in length! A massive collection featuring the superhero industry's most revered humorist! Foreword by industry legend and creator of Spider-Man and The Fantastic Four, STAN LEE!